I had first seen Speed Racer a long while ago, and while in terms of story and characters, the film had a puerile manufactured quality (the fat kid brother of the lead character was an annoying git), the near hallucinatory audio-visual experience with a super-vibrant color palette and constant use of gimmicky wipes and dissolves was sufficiently engaging for me to get the film on blu-ray. In fact the disc was in my collection for nearly 6 years but only last night (after I returned exhausted and wanted some trashy entertainment) did I feel the momentum to re-watch the film. I understand Speed Racer is based on an anime TV series and the Wachowski director duo incorporate a lot of the hyperbolic anime style in their film, with the deliberate flat photograpy, improbably cheerful Michael Giacchino score, utterly nuance-less characters (I sure hope Susan Sarandon got a good paycheck) and the clunky in-your-face graphics during the non-vehicular action sequences (which are like a combination of the 60's Batman TV series and 80's Indian campy Ramayan TV series). At more than 2 hours the film is a bit of a (ha!) drag, and could have definitely done with excising of needless characters (fat kid bro immediately comes to mind, although I understand he's a regular part of the anime series). But every time the film takes you to a race track it's the visual equivalent of having head-exploding drugs without the side-effects. Compared to current day blockbuster extravaganzas the effects seem a little dated and the car physics don't feel sufficiently weighty, but they remain consistent to the cartoony aesthetic. I also appreciate that the Wachowskis were honoring the family-friendly nature of the original show, this is a film kids will love. 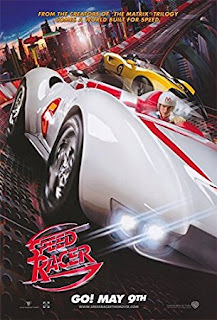 The blu-ray of Speed Racer had rave reviews for its video on release. One wonders if a new scan / encode would raise the bar further, or whether the limitations in terms of texture are more a function of the high-definition digital capture technology of that time. Nonetheless it is an attractive, extremely vibrant transfer and great reason to have this film in one's collection. I'm more hesitant about the audio. I'm not per se against lossy audio (and a 5.1 Dolby surround track at 640kbps is not something to sneeze at), but while dialog was clear and surrounds were active during the race sequences, I felt a certain deficiency in oomph factor even on raising the volume, not sure why.